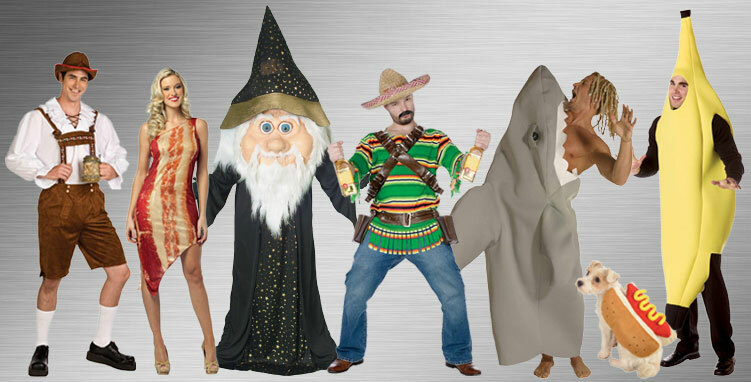 This collection of Funny Costumes includes lots of different laugh-bringing looks! 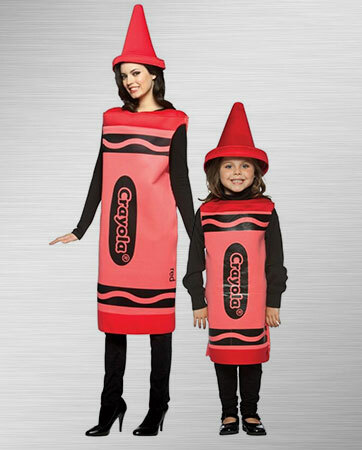 Colorful costumes, silly outfits with strange proportions, unexpected styles, and more! There are plenty of costumes to choose from, so your next night of trick-or-treating or a Halloween party will be even better! Give everyone a big laugh this year! For any season, or party for that matter, there’s no better way to celebrate the occasion than by making your guests laugh. In an instant you can easily turn on the charm in one of our made-for-the-stage character costume options, and before you can say, “International Man of Mystery” everyone will be laughing not only AT you, but WITH you. “Fowl play” is the name of this game! And the "Chicken Dance" is only the beginning. The spotlight is yours as you turn into the funkiest chicken in town, because in this ensemble, no one will ever call you “chicken” again! "Up and atom!" You certainly won’t fall short when becoming this comic book superhero. In our Radioactive Man ensemble, your powers of persuasion are only the beginning. An evening of hilarious antics is definitely in the cards when you play this superhero who acquired his powers after surviving an atomic bomb explosion, WOW! Quote: "Congratulations, Bart Simpson, you're our new Fallout Boy!" We've all seen them, or, wait for it…..YIKES, BEEN them! You know the pair, fresh off the cruise ship and looking to see a bit of local culture before being herded onto their next sun-soaked destination. Well, here’s your chance to play it up AND make your friends laugh at your next party. You're sure to be the top banana when you arrive at your bash wearing this “a-peeling” costume! Everyone is sure to go bananas, and they can’t help but laugh heartily when you walk in dressed in our one-piece banana-shaped tunic. Can you say, “Carmen Miranda,” cause if she’s in the bunch she’ll be shimmying your way in no time! Quote: "Did someone say monkey business?" Here’s your chance to play a character from one of TV’s favorite working-class families. Imagine your home in the misfit middle-American city of Springfield and set the stage. 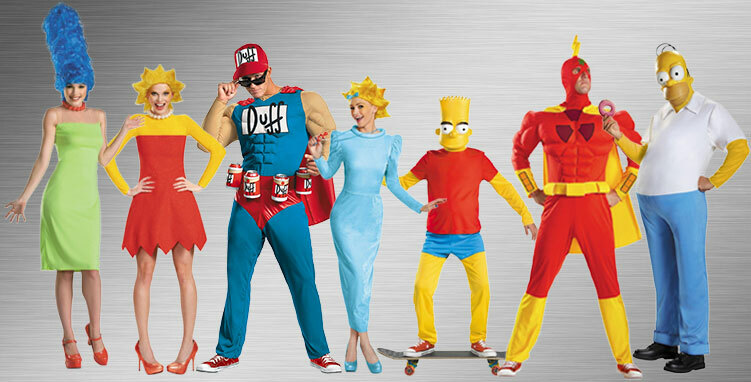 Slip into the costume of Homer and morph into his persona. Be a man who works as a safety inspector at the Springfield Nuclear Power Plant; a position totally at odds with his careless, buffoonish personality. Or try Marge on for size! She’s a stereotypical American housewife and mother, with a lot to say! Let your kids have fun as one of their three kids. Bart, a ten-year-old troublemaker; Lisa, a precocious eight-year-old activist and, of course, Maggie is the baby of the family who rarely speaks, but communicates by sucking on a pacifier. Dysfunctional relationships never looked or felt so fun! 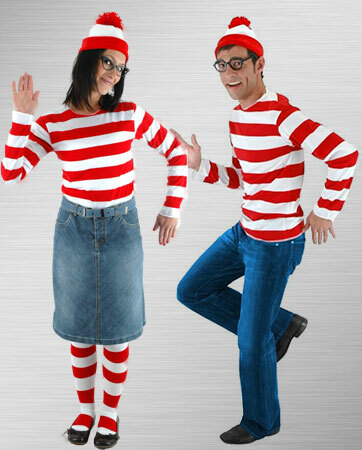 Here’s your chance to play the iconic, elusive Waldo and his girlfriend Wenda. You’ll have a blast as these two. Prepare to get into and out of all kinds of adventures while donning your iconic red-and-white striped shirts and pom-pom hats. Don’t forget your magic walking stick! Being true to your inner self and following your own path despite the obstacles that may come your way is the meaning behind this charming character. Funny, insightful and colorful, playing this lovable character is sure to have you feeling like “What identity crisis?” I know who I am and I’m fabulous just the way I am! Flower Power is alive and well and that late 60s vibe becomes you! 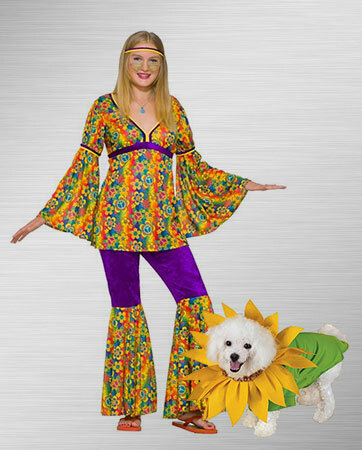 Channel your inner groovy spirit by wearing this colorful ensemble to your next event. And if you’re “heading” out to a music festival anytime soon, you’ll be ever so stylish there as well. Check your latest fashion mag for ideas! I’m not gonna say, “Who you gonna call?” Whoops, I just did! The Ghostbusters are still running their supernatural pest-control business, but they've made some new additions to the staff, particularly Slimer. 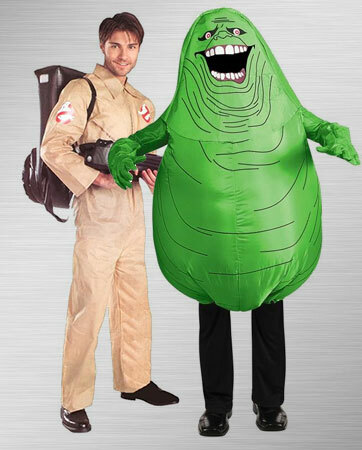 Formerly a minor character, this inflatable green ghost steps up to MAJOR sidekick. Grab a friend, get into your costumes and stir up some energy! Beetlejuice, Beetlejuice, Beetlejuice. Yes, I said it, you knew I would. Thrice is nice and this fabulous ensemble delivers it all in triple time! 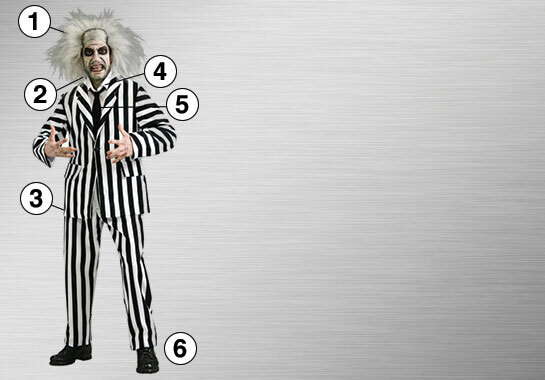 The iconic striped Beetlejuice jacket, shirt, and pants are all something right out of the famous movie. Famous for their antics, this group of mischievous ghosts likes to get down to the Banana Boat Song, Tiki Room anyone? You’ll be feelin' the vibe, too, while wearing this ensemble. The wig, complete with shocked white hair, jacket, pants and shirt, along with the tie and makeup kit, are all at your fingertips to help you pull off the look. Your friends will surely be spinning their heads around when you show up as this guy! So get out, haunt all your favorite hangouts and live it up, because you only live once. I take that back, you’re immortal. I forgot! Here’s your chance to get away with naughty comments and fab one-liners in the same way only this legendary spy from the past can. Yes you CAN become an International Man of Mystery as fast as you can change into this Austin Powers ensemble. 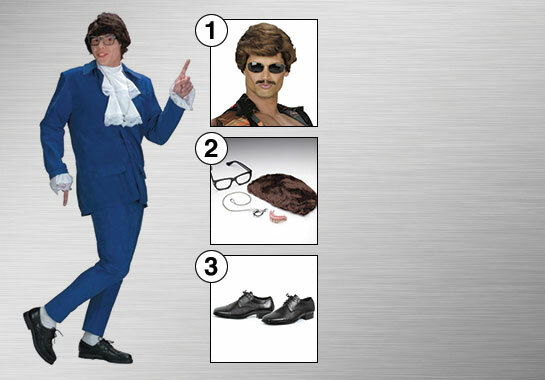 You can complete the look with the leading man wig, Austin Powers accessory kit, and black loafers. Dr. Evil is no match for you as you zing partygoers with punch lines and one-liners. Brush up on your “swingin' 60s” lingo because as this savvy secret agent you can NEVER be too clever or too cool!